This is a delicious, hearty soup that will keep you warm and well-fed this winter. The complex Ethiopian spices take this lentil soup into a whole different category than your standard lentil soup. The addition of quinoa adds nutrition and protein to an already satisfying meal. Lentils are both economical and packed with nutrition - full of protein and antioxidants. You could easily add greens like chard or kale to this one. Ginger root is a nice addition as well. I add a dash of lemon and some hot sauce for a bit more kick. Add a can of coconut milk in the winter for a bit more fat. 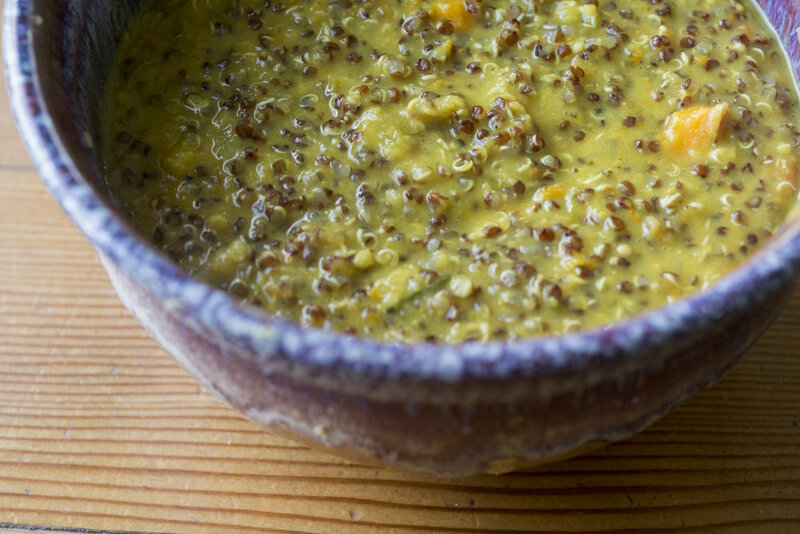 Put the lentils and sweet potato (cubed as small as you like) in a soup pot with 10 cups water, the turmeric, 2 T. of ghee (or coconut oil) and 2 ½ t. of the salt. Bring to a boil, then lower heat and simmer until the lentils are soft and almost falling apart – 15 minutes. While the lentils are cooking, heat a medium skillet over medium heat and add the last T. of ghee (or coconut oil). When it’s hot, add the onion, carrot, cumin, and mustard seeds, 1 t. of the berbere and cilantro stems, stirring occasionally. When the onions are soft, add them to the lentils with the chopped cilantro leaves and then add the juice from two limes. Taste and add more, if needed to bring up the flavors. It should be a bit sour. Finally, stir in cooked quinoa. This meal was inspired by a Paris cafe meal last year. We had a great lunch at Café de la Nouvelle Mairie. Truth be told, the best part of that meal was the cafe space and the natural wines. The food was just decent. I was inspired to make the Sausage and Lentils at home and it has since become a meal I make regularly. It's healthy and satisfying and the recipe makes a good amount of food - enough for a meal for two people and leftovers. Seek out the French green lentils, since they stay firm without getting mushy. I haven't tried it yet, but I'm guessing this will make a great dehydrated meal for my next adventure. Bring lentils, water, 1/2 teaspoon salt and bouquet garni to a boil in a 2-quart heavy saucepan, then reduce heat and simmer, uncovered, until lentils are just tender but not falling apart, about 25 minutes. Meanwhile, lightly prick sausages in a couple of places with tip of a sharp knife, then cook sausages in remaining 1/2 tablespoon oil in a 10-inch nonstick skillet over moderately high heat, turning occasionally, until golden brown and cooked through, 12 to 15 minutes. Transfer to a cutting board. Drain cooked lentils in a sieve set over a bowl and reserve cooking water. Stir lentils into vegetables with enough cooking water to moisten (1/4 to 1/2 cup) and cook over moderate heat until heated through. Stir in parsley, pepper, 1 tablespoon red wine vinegar, 1 T apple cider vinegar and 1 tablespoon fennel fronds. Season with vinegar and salt. Cut sausages diagonally into 1/2-inch-thick slices. Serve lentils topped with sausage. Drizzle with extra-virgin olive oil. This is another meal that has become a staple for me. It's ridiculously easy to make, just load up the crock pot and let it cook for up to six hours. The result is close to a risotto - warm, creamy, and satisfying, especially on a cool, rainy day. I feel like this crockpot recipe is far superior to risotto since it doesn't require hours of stirring in broth. I give this recipe bonus points for frugality. I think we get 3 meals from this recipe. Farro has always been popular in Italy. It's an ancient grain and was enjoyed by Egyptians and Romans alike. It has a great nutty quality and is delicious. It's readily available these days. I bought a 24 oz. bag of Bob's Redmill for around $5. You can also buy it in bulk at Fred Meyer. I get four meals out of one bag, since the recipe calls for one cup of farro. Again, I would love this in camp after a long day on the bike. Grind a bit of fresh pepper and parmesan on top. So good! Cover and cook until the chicken is tender, on low for 4 to 4 ½ hours or on high for 3 to 3 ½ hours (this will shorten total recipe time). Bison Chili and Lamb Rogan Josh (both recipes below) are the two meals that we dehydrated and took with us to Alaska. There is nothing more satisfying after a long day on the bike to know that dinner is already made and that it's going to be hot and delicious. Andrew Weil has a wonderful book called “True Food” which I highly recommend. Andrew Weil has done quite a bit of work around the Anti-Inflammatory diet I did a lot of research when I broke my fibula, both because I was motivated to give my body the best conditions for healing and obviously when not riding, I had a lot more time on my hands. Even when you're not broken, this diet makes a ton of sense, since recovery is all about reducing inflammation and letting the body heal and recharge before you go out and do it all again tomorrow. 1. In a large pot, heat the olive oil over medium-high heat. Add the ground bison and season with the salt and pepper. Cook, stirring occasionally, to brown the meat, 3 to 5 minutes. Add the onion and sautee for 2 minutes. Add the garlic and continue cooking for another 2 minutes while stirring. Add the cumin, ancho pepper puree you made in vitamix/food processor, and red pepper flakes. Stir and cook for another minute. Add the tomatoes, beans, and chicken stock. Stir well and brind to a simmer. Reduce the heat to low and simmer for 30 minutes, stirring often to prevent sticking. 2. Add the chocolate, dried oregano, paprika, cinnamon, and salt. Stir and let simmer for another 15 minutes. Add the fresh oregano. Adjust the seasoning. Simmer for 5 minutes. …or for your next overnighter, refrigerate, and put in dehydrator the next day. 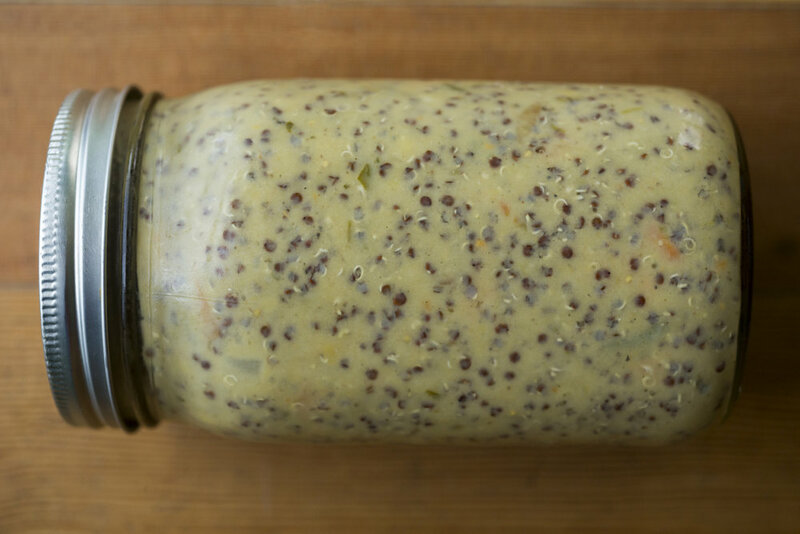 You can also bulk it up with quinoa since it rehydrates nicely. Add the toasted spices to a pestle and mortar and grind until fine, or put them into a food processor and blend to a powder. Either way, when you've ground them blend the toasted spices in a food processor with the rest of the ingredients until you have a smooth paste. 1. In a food processor, blend together onion, garlic, ginger, all of the ground spices, salt & tomato puree. 2. Heat oil or ghee in large saucepan or flameproof casserole. Add the lamb pieces and cardamom pods. Quickly fry until the lam is browned all over. This may need to be done in 2 batches, depending on the size of you pan. Stir in the spicy paste and cook for about 5 minutes, stirring frequently. Pour in the lager and bring to a simmer. Cover with a lid and cook for about 1-1 ¼ hour, stirring occasionally, until the sauce has thickened and the lamb is lovely and tender. Leave the dish for 5 minutes before serving. This is a staple around our house. It's simple to make and is very satisfying. The key is using French lentils, which are heartier than red or yellow lentils, which become mushy. It starts with cooking the french lentils with the fresh herbs. You can be doing the second step, which is to sauté onion, garlic and red pepper, then adding wine and tomatoes. Add tomato/wine mixture to lentils, add kale, and you're done. It's super simple. 2. Meanwhile, warm the olive oil in a medium skillet. Add the onions, garlic, and red pepper flakes and sauté over medium-low heat for 8-10 minutes, or until the onions are softened and begin to brown. 5. Add the kale leaves, rosemary, and thyme and turn off heat. Let the chard leaves sit in the soup for five minutes before serving. The hot soup will wilt the leaves sufficiently.